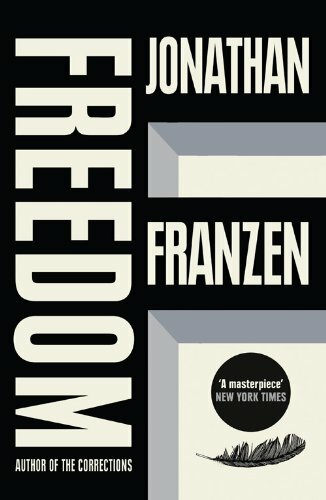 "In his first novel since The Corrections, Jonathan Franzen has given us an epic of contemporary love and marriage. Freedom comically and tragically captures the temptations and burdens of liberty: the thrills of teenage lust, the shaken compromises of middle age, the wages of suburban sprawl, the heavy weight of empire. In charting the mistakes and joys of Walter and Patty Berglund as they struggle to learn how to live in an ever more confusing world, Franzen has produced an indelible and deeply moving portrait of our time." I'm glad that I came across this book. That's one. The second is, that it is a page turner, like the blurp on the back cover said it would be. BUT despite I kept reading, I was not very fond of it. I did not like the characters, none of them. That is very unusual, because normally I find one or two in a book that I like, no matter how I dislike the rest. But here that wasn't the case. The book kept me reading because the subject / stories that are told about the lives of the Berglund family are so recognizable. It isn't necessary to have experienced anything in your own life, you just know / recognize. Having said that, I think there were too many pages in the book and although there may be made a deliberate choice to build the story lines like they are now, I did not like it very much. It got me confused from time to time. What I disliked most in the part where Patty is talking, where we get the fruits of the assignment her therapist gave her, is that there is a mentioning of 'the autobiographer'. Once that is okay, twoce too, but so often, no thank you. Call her by her name, let her 'speak' for real and do not refer to her in third person even when her diary / story of her life told by her is involved. Reserved for one of the winners in my 1000-books-registered RABCK. I got you a book from your wishlist. I hope you like it. Wow, what a fantastic surprise from my wish list! Thank you so much for this RABCK, I'm looking forward to reading it. It will be on top of my TBR-mountain. I'm really glad I got the chance to read this one. However, I was a little bit dissapointed. I liked the first 250 pages, the build up of the story and the rather tragic history of Patty and Walter, but then it started to become boring. Perhaps the author wanted it to be long and a little boring as to prove the point about life? If so, he didn't suceed very well. I especially disliked the part about Walter and the trust, because it was too pseudo political and strange for my taste. I agree with you boekentrol that I didn't like any of the characters and that is indeed strange, usually there is at least one person in a book I have some kind of sympathy for.